Can the brothers accomplish this feat in a Nashville market that is booming? We get a lot of great tips for both buying and selling as they try. Check them out! 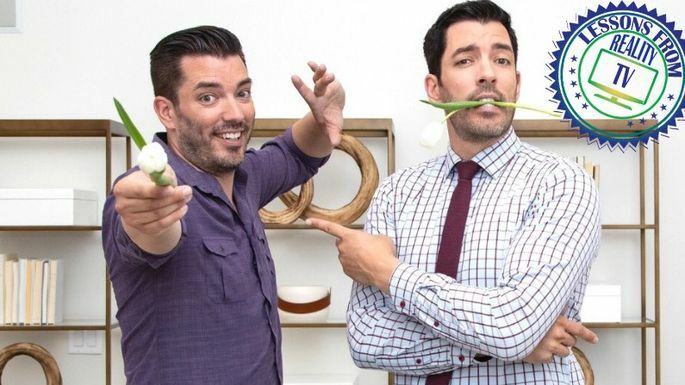 Renovation pros Jonathan and Drew Scott have helped plenty of people move into larger homes, but in the latest episode of "Property Brothers: Buying and Selling," they help a Tennessee family go small. In the episode "Downsizing to a Single-Story Home," we learn that almost-empty nesters Terry and Novella want to buy a smaller house with fewer bedrooms and no stairs (Terry has bad knees). They also want a house that's closer to Novella's work and has room to park Terry's trucks. Drew is excited to find them a gorgeous home in the right neighborhood with a three-car garage, until Terry explains he has "big trucks." We're talking big rigs for long hauls. 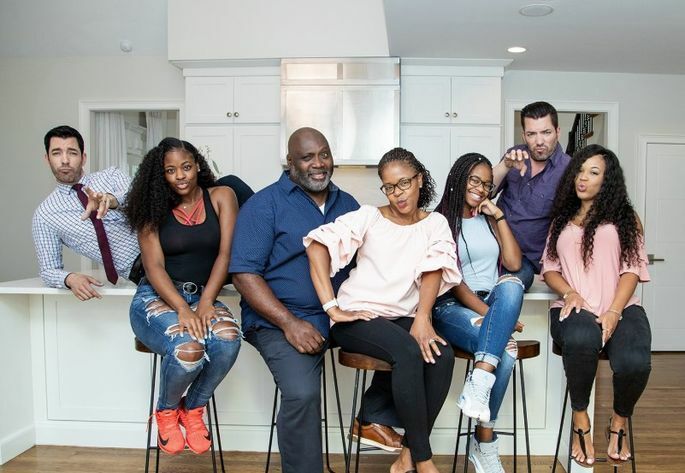 The couple have $450,000 to spend, and Jonathan thinks he can finish the renovation of their old home in about four weeks, for $35,000, since it was renovated relatively recently and there is no major construction to be done. The large family home is in a housing tract among very similar homes, and Drew says it's important to make theirs stand out. One easy and relatively inexpensive way to do that is to change out the front door to something modern and beautiful. It's details like this, says Drew, that will make potential buyers passing by want to stop and check out the house. Terry and Novella's home has a big, beautiful, grassy front yard, but there's a patch of 6-foot-tall weeds near the front porch that is just begging for new landscaping. Once Jonathan helps the gardeners trim the plants, get rid of the weeds, and add a few simple shrubs, the house really sparkles and is even more distinctive. Oddly, Terry and Novella haven't furnished the living or dining rooms that much. Novella confesses that her idea of decorating is placing a tablelamp on the floor by the fireplace. 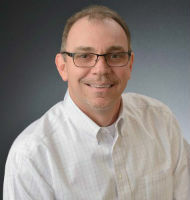 "When you're trying to sell a house, it makes a difference when you stage it," says Drew. Staging is an easy fix, one of the reasons Jonathan can do the renovation so economically. Adding dramatic light fixtures draws attention to the high ceilings. Terry and Novella's house has gorgeous, high ceilings, but you'd never know it, because everything interesting in the rooms is at eye level. 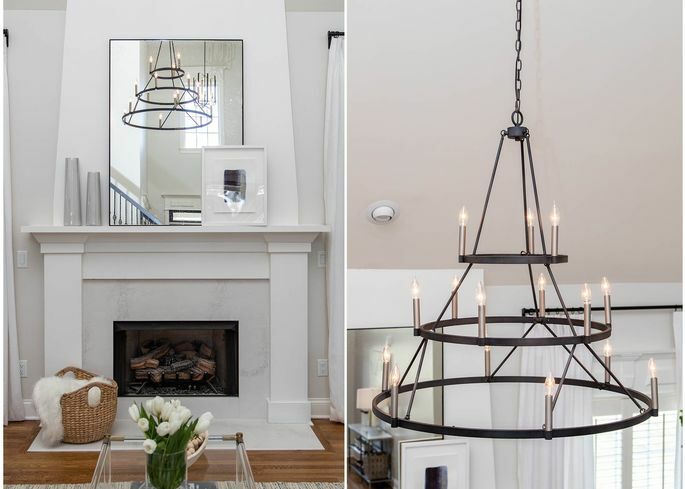 Jonathan finds simple, modern chandeliers to hang, drawing attention upward and making the house seem spacious. 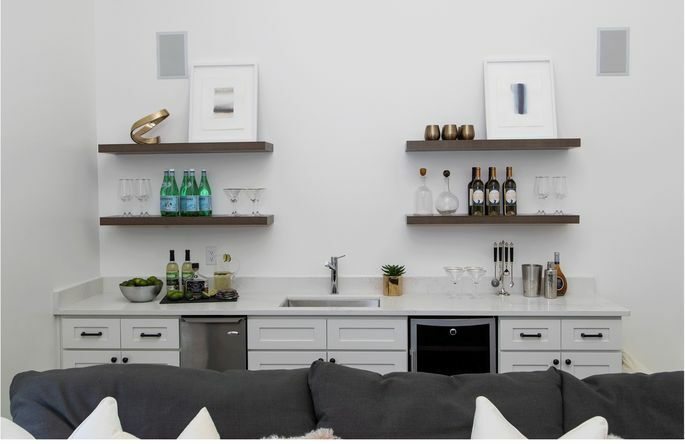 This wet bar with open shelving was easy to add, and made a big difference in the room. The couple have an upstairs bonus space where they store their gym equipment. Jonathan sees it as the ideal family room/media room where the kids can easily gather, since it's on the same floor as their bedrooms. Jonathan clears out the room and paints it, and moves the big-screen TVdown a few feet so it's just a little above eye level (not even Novella knows why she mounted it so close to the ceiling). But the biggest difference comes in building a wet bar with open shelving across the back wall. It's a relatively simple structure, but it contains a sink and a small fridge, making the room much more accommodating. According to the potential buyers who tour the place, it's a major selling point. When Drew takes the couple house hunting, one of the homes that he shows has a spacious, well-designed kitchen, but the cabinets are made of wood that looks dated, and their dark color makes the kitchen seem much smaller than it is. "Paint the cabinets and change the hardware," Drew advises. A nice, light white and some modern hardware could make a world of difference. Do the Scott brothers deliver? Jonathan encourages Novella and Terry to list their newly renovated home for $490,000, and that price helps bring in scads of potential buyers. One family is so impressed, they offer $505,000 to snap it up before anyone else does. That makes the couple comfortable about spending $465,000 for a recently renovated new home they love. It comes with over an acre of land—and a prime big-rig parking space in back, discreetly away from the street. Best of all? 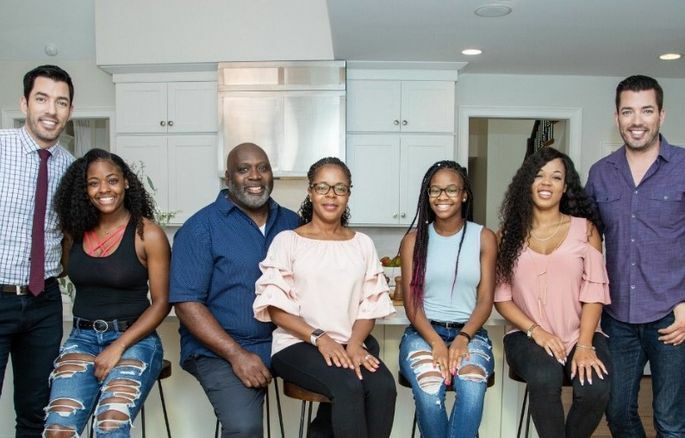 Their new four-bedroom house is big enough for their daughters to come home again (and perhaps not surprisingly, no one is complaining).